It’s a new year and a new segment of our new life — the Cambodian segment. Although I have been coming here to work for years now, this time it’s different. I have a newly retired husband with me not only to carry my bags (as he so quaintly puts it) but to help me run Writing Through. Plus, we are here for longer. namely four months. In other words, not only will I be working here, I will be living here for part of the year. In the inimitable words of The Grateful Dead, What a long, strange trip it’s been. I attended a Khmer engagement ceremony yesterday. It was quite something, as was the back story. 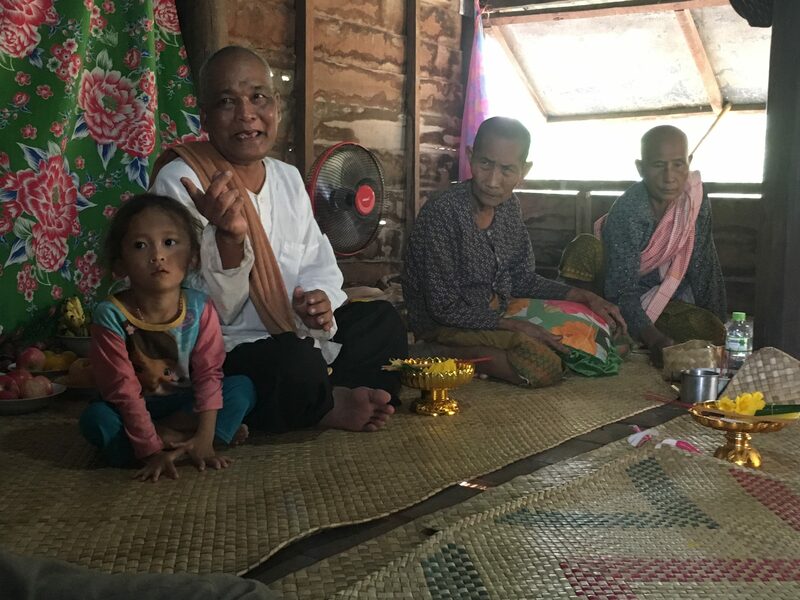 It turns out that the son of one of our landlord’s cousins became romantically involved with a young woman from a farming village outside of Siem Reap. They’ve been dating for a few months and have “known” each other. However, in the view of the girl’s family and the village medicine man, this arrangement upset the spirits of the girl’s ancestors, who malevolently took it out on the girl’s mother by causing her to get a urinary tract infection. It’s a little unclear how the spirits got wind of the illicit romance but I guess that what spirits do. 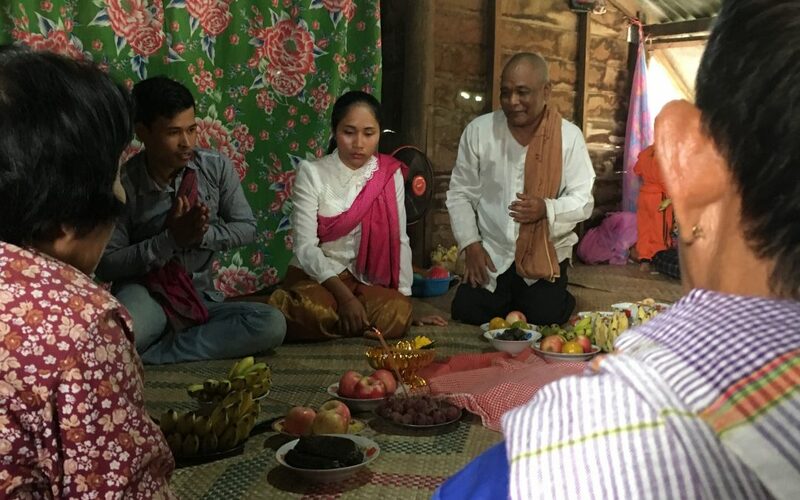 The only solution to the UTI issue was to hastily convene a “shotgun” Khmer engagement ceremony in the girl’s home, supervised by the village priest and the two oldest women in the village. The groom-to-be hails from a village far away from Siem Reap, so his immediate family couldn’t make it, so our landlord asked me if would come along to fill out the numbers on the groom-to-be’s side, which I was happy to do. The bride-to-be comes from a very poor family, so she was very embarrassed that she couldn’t get all dolled up as is customary for these things (the engagement ceremony was put together on 24 hours notice). The family couldn’t believe that a fancy-looking barang (foreign white person) had actually come to their home. I got a seat of honor and everyone fussed over me to make sure I was comfortable. The village old ladies took an immediate shine to me. I guess I’ve still got it! They kept touching my skin and (according to my friend who translated) marvelling at its whiteness! I’ve attached a few photos of the ceremony. I was very surprised that the old ladies gave their permission to be photographed. Stay tuned for some more adventures. Love this! Bob and I were invited to a wedding last year…an amazing experience!